I tend to design with whimsical surprise in mind. When we were assigned this project, I took a look at the examples — LED Zodiac Hoops & Electronic Embroidery — and was reminded of my love for patches! When I was younger, I loved the idea that I could affix a patch (or sticker) and sew/stick/glue it almost anywhere.. bags, backpacks, notebooks, lockers, the wall — they were all the ‘canvases’ that held my individual marks of branding who I was for whatever period of time I was interested in whatever thing. My first design project for others/mass production was in the year 2000 where I made a patch of an Alien surfing the galactic way of El Capitan Beach for a Girl Scouts camping event - photo not available unfortunately.. somewhere there is a patch hiding in storage, yet to be found (and will update if I ever do find it!). But the truth is I loved patches. I loved the texture; the depth; and the colors typically used. When I began ideation for this project, I knew I wanted to create a dynamic patch, where there would be a surprise element, incorporating the assignment of creating a simple circuit with 1 switch, 2 LEDs, and a battery compartment. I was inspired to do something playful with stars — I quickly saw a shooting star (or three) as the interactive elements that would bridge this idea into creation. From there, I narrowed the design down to 2 shooting stars and put forth into effect the design to make LED’s in parallel circuitry be controlled by a switch that would be simple for the user to interact with. It was important for the design to look good not powered, as well as look good powered. I liked the idea of making the switch a snapping mechanism that interfered with the circuitry as an open current when connected and was closed when disconnected. The results turned into a patch that worked in both cases. The process of creation was a bit intricate. 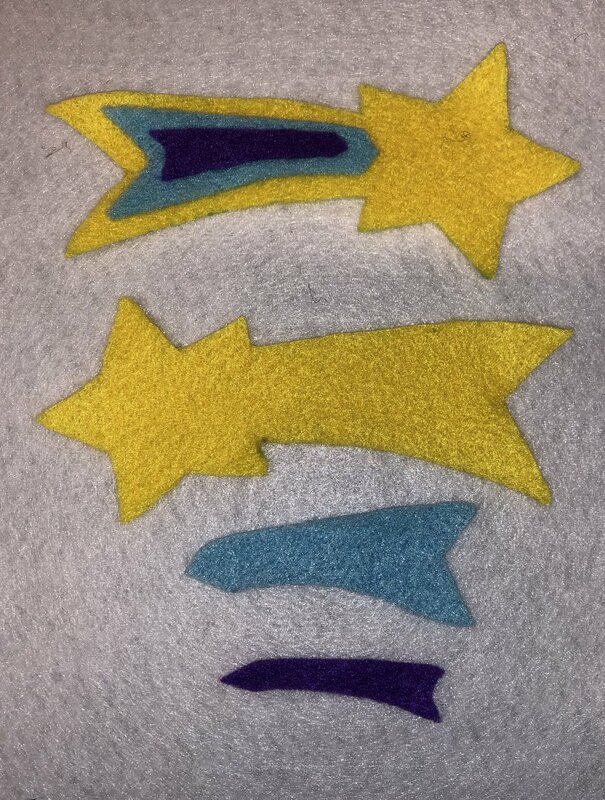 I first designed the shooting stars from three colors of felt (yellow, light blue, and purple) and glued them together forming the three-dimensional imagery on the dark blue felt. I also used a piece of canvas that acted as the circuitry fabric, where I could hide the electrical elements and components — ie hidden LEDs!!. The top Shooting star was created to be the battery holder (for a 3V lithium coin battery) and the bottom shooting star was created to be the snapping switch. I layered the fabrics and stitched the stars onto the blue felt first, while seaming together the canvas piece and working back and forth between the two. I also reinforced the battery holder and switch with additional fabrics that I found in the shop (a yellow polyester/cotton blend and a magenta polyester blend). The yellow fabric was used for the battery compartment and snap on blue felt, and the magenta fabric was used for the reinforcement on the shooting star snap. The result was a fairly simple circuit creation that took hours to hand stitch and plan out. I learned that the battery holder needed a bit more structure (as felt stretches over time) and had to augment by sewing in an additional piece of conductive metal to help keep the battery in place. Another learning lesson was sewing in the snaps to face the correct snapping direction — seems simple but after hours of work was a simple mistake that took some time to repair. I am going to take into account these learnings and make sure to plan in more time for test before production. All and all I’m very happy with this creation and may build out more dynamic patches in the future!